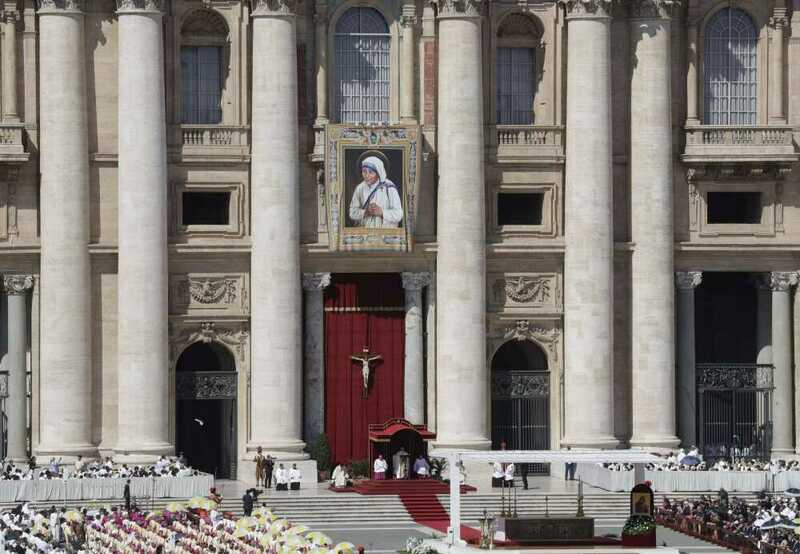 A tapestry depicting Mother Teresa hangs from the balcony of St. Peter's Basilica as Pope Francis, standing at bottom, celebrates Sunday a Canonization Mass at the Vatican. VATICAN CITY -- Elevating the "saint of the gutters" to one of the Catholic Church's highest honors, Pope Francis on Sunday praised Mother Teresa for her radical dedication to society's outcasts and her courage in shaming world leaders for the "crimes of poverty they themselves created." 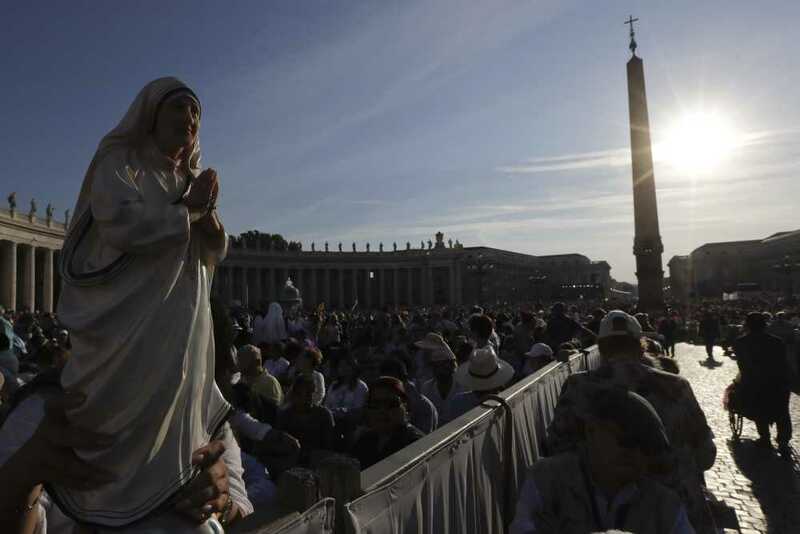 An estimated 120,000 people filled St. Peter's Square for the canonization ceremony, less than half the number who turned out for her 2003 beatification. It still was the highlight of Francis' Holy Year of Mercy and possibly one of the defining moments of his mercy-focused papacy. Francis has been dedicated to ministering to society's most marginal, from prostitutes to prisoners, refugees to the homeless. In that way, while the canonization of "St. Teresa of Kolkata" was a celebration of her life and work, it was also something of an affirmation of Francis' priorities, which have earned him praise and criticism. Irma Escuero of New York holds a statue of Mother Teresa on Sunday before the start of a Mass celebrated by Pope Francis at which Teresa was canonized in St. Peter's Square. Born Agnes Gonxhe Bojaxhiu on Aug. 26, 1910, Teresa came to India in 1929 as a sister of the Loreto order. In 1946, she received what she described as a "call within a call" to found a new order dedicated to caring for the most unloved and unwanted, the "poorest of the poor" in the slums of her adopted city, Kolkata. The Missionaries of Charity order went on to become one of the most well-known in the world, with more than 4,000 sisters in their trademark blue-trimmed white saris doing as Teresa instructed: "small things with great love." At the order's Mother House in Kolkata, hundreds of people watched the Mass on TV and clapped with joy when Francis declared her a saint. They gathered around Teresa's tomb that was decorated with flowers, a single candle and a photo of the wrinkled saint. "I am so proud to be from Kolkata," said Sanjay Sarkar, a high-school student on hand for the celebration. "Mother Teresa belonged to Kolkata, and she has been declared a saint." For Francis, Teresa put into action his ideal of the church as a "field hospital" for those suffering both material and spiritual poverty, living on the physical and existential peripheries of society. In his homily, Francis praised her as the merciful saint who defended the lives of the unborn, sick and abandoned, recalling her opposition to abortion that often put her at odds with progressives around the world. "She bowed down before those who were spent, left to die on the side of the road, seeing in them their God-given dignity," he said. Teresa's most famous critic, Christopher Hitchens, accused her of taking donations from dictators --charges church authorities deny. Francis chose to emphasize her other dealings with the powerful. "She made her voice heard before the powers of the world so that they might recognize their guilt for the crimes of poverty they themselves created," he said, repeating for emphasis "the crimes of poverty." Hundreds of Missionaries of Charity sisters had front-row seats at the Mass, alongside 1,500 homeless people and 13 heads of state or government and even royalty: Queen Sofia of Spain. For the homeless, Francis offered a luncheon afterward in the Vatican auditorium, catered by a Neapolitan pizza maker who brought his own ovens for the event. "Her heart, she gave it to the world," said Charlotte Samba, a 52-year-old mother of three who traveled with a church group from Gabon for the Mass. "Mercy, forgiveness, good works: It is the heart of a mother for the poor." Francis has confessed that he was somewhat intimidated by Teresa, knowing well she was as tough as she was tender. He quipped during a 2014 visit to Albania that he never would have wanted her as his superior because she was so firm with her sisters. But Sunday, he admitted even he would find it hard to call her "St. Teresa" because her tenderness was so maternal. "Spontaneously, we will continue to say 'Mother Teresa,'" he said to applause.